Energy efficient, durability and resale value, add up to big savings! Buying a home is one of the largest investments you’ll ever make. Invest wisely. A Shotcrete Home home will pay you back in terms of operating cost, resale value, and quality of living. Over the long run, benefits like energy efficiency, disaster and fire resistance, and durability reduce the cost of owning a home. Reduced noise and more even temperatures mean quiet comfort that you can enjoy year round. The mass of the concrete slows down the passage of heat or cold moving through the wall. With the same insulation, a concrete home stays warmer in the winter and cooler in the summer. Concrete walls do not rot and do not need to dry out (breath) and are therefore more air-tight than wood-frame walls. Since leaks account for a large percentage of energy loss in the home, concrete homes enjoy savings in energy consumption. The house is square and has floor area of 100 square meters. The house meets insulation requirements and is typical of the vast majority of new houses built today. The walls are insulated to code standard (90mm timber frame stud with R2.6 insulation).The house has one large double glazed north facing window. 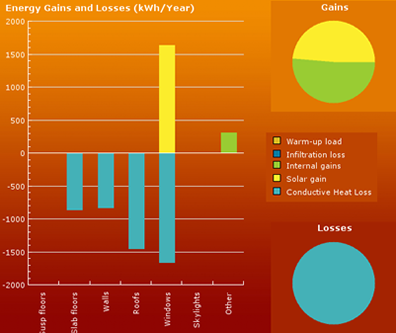 The energy lost from both the floor and walls is approximately 5400 KWH/Year. This is the data of the same house using the Shotcrete home Thermal 300 wall and Warm Floor systems. 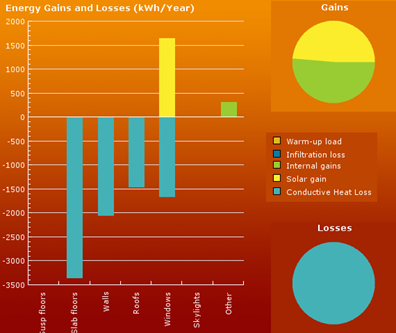 Approximately 1700KWH/Year of energy is lost. That’s a dramatic 3700KWH saving. Most houses are much larger than this one so more savings can be expected.